Reichenbach Middle Blue (RL3018) is a pretty light aqua. The rods I had seemed to be seeded with itty bitty bubbles, which I found a little odd. There were too many, too consistently through the rods for it to be an accident (or maybe not?) 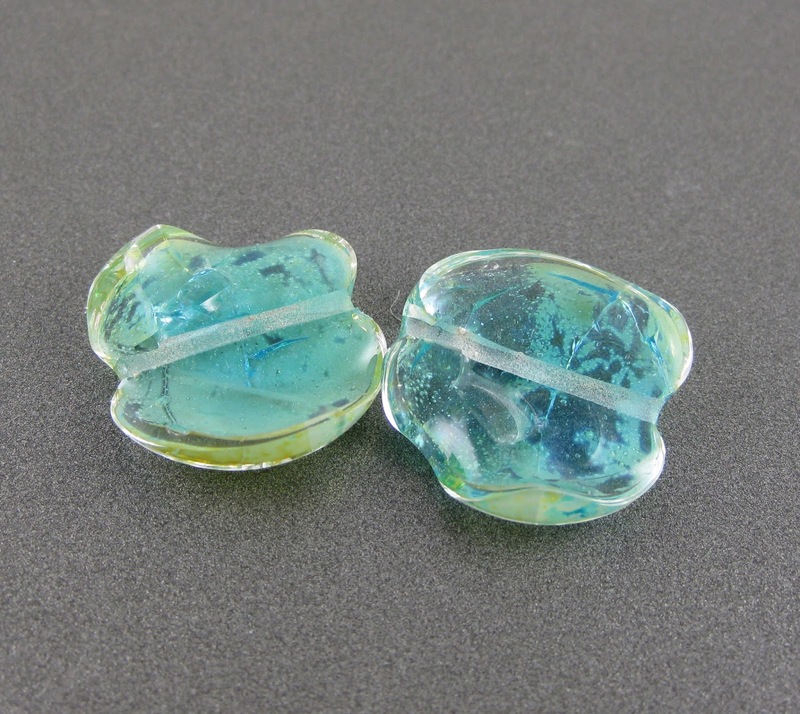 and the result is sort of pretty, unless what you want is a smooth, bubble-free transparent aqua. This colour, or at least this batch of this colour, was very stiff -- much stiffer than the other transparents I've tried from this line. Possibly because of this difference in viscosity, I had some dramatic incompatibility issues with this colour, which you'll see as we go through the tests. Middle Blue darkens a little if you reduce it. I was trying to get it to turn red, but it refused to do that. The left half of this bead was Effetre Light Aqua, and the right half was Reichenbach Middle Blue. 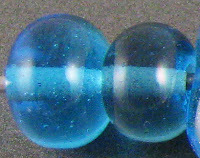 You can see a compatibility crack around the middle of this bead where the two colours meet. 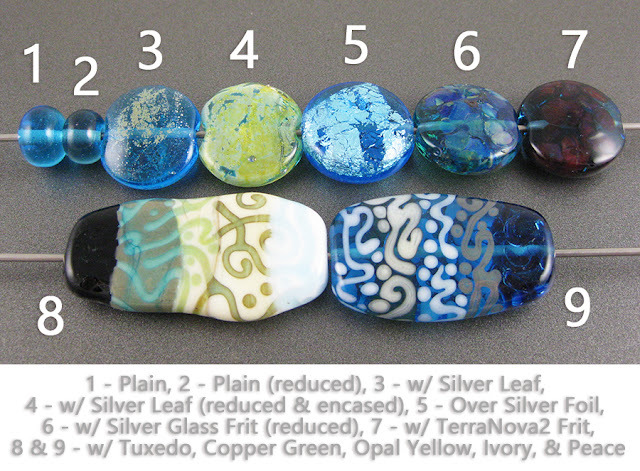 Middle blue is not terribly reactive with silver, although I got some yellow fuming in the middle bead which may be as much due to the Clear as the Middle Blue. 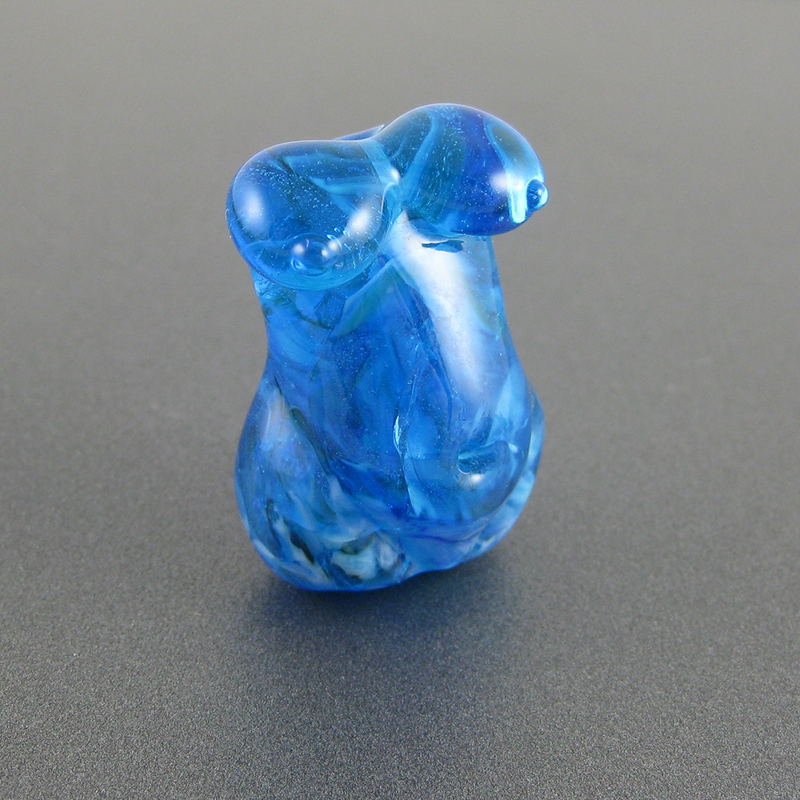 The middle bead is a core of Middle Blue, rolled in silver, and encased with Effetre Clear after reducing the silver. I'm not sure you can see all of the cracks in the bead from the picture above, so I included a photo of the bead in the two pieces that it divided itself into, below. This kind of cracking can only be from incompatibility, so this batch of Middle Blue is clearly not a great fit for using with other 104 CoE colours unless you can find some with a comparably stiff viscosity. If you do plan use this colour with other glasses, make sure you do some pre-production testing first. Middle Blue was not particularly interesting with either my reduction frit blend or my TerraNova2 frit. Middle Blue is not a very reactive colour, but I did get some dark line reaction with Ivory. The most interesting thing about this reaction was that it happened when I used the Middle Blue on top of the Ivory, but not when I used the Ivory on top of the Middle Blue. I think this is because the reaction is fairly gentle and happens where the two colours meet, but isn't strong enough to wrap the edges. It's only visible through the Middle Blue because it is transparent. I didn't make any surviving beads with this colour. I tried a goddess with some frit, but it is cracked all through. here's a photo of it anyway.